Earlier this year, we thought for a little while that we might have to move to Atlanta for work. For a variety of reasons, we didn’t want to go, although we like Atlanta just fine. Spoiler alert: We stayed in Montgomery. But as we weighed the pros and cons, one thing stood out to us – that it would be nice to live in a city where you could pay someone to bring you Thai food at night. Montgomery has long struggled with effective food delivery options, and until recently you were pretty much stuck with pizza or Steak-Out. This is not because we live in the far-off suburbs. There just have not been many delivery options in town for those lazy nights when you don’t want to cook or see other people. But there’s a new game-changing delivery service in town, and although they don’t yet deliver Thai food, Waitr does deliver a number of other options, including the passably good Chinese food we got the other night from Panda House (General Tso’s tofu – deliciously deep fried!). It’s easy to use – it’s a free app that you put on your phone, and ordering is a snap. You choose from the various restaurants they serve (including Sa Za, Little Donkey, Wintzell’s, Touch of Soul, D’Road and what seems like a million Chik Fil-A locations), page through the menus, choose what you want, and order. The delivery fee is $5. We’ve only used it once, but our food arrived speedily and still hot. The delivery person was nice, and the lemonade was intact. We’re sold. We still like getting in the car and visiting traditional “brick and mortar” restaurants, but it’s really nice to be able to pay for the luxury of having someone bring the food to your door. We hope that the Waitr app will continue to expand the kinds of restaurants that it offers, and hope that more places will partner to offer this service. In other food news, we continue to love Vintage Year. Every time we eat there, we ask ourselves why we don’t go there more often. The veggie farro bowl they have on the regular menu may be the best vegetarian entree in town, and their fish specials are always good. Two weeks ago, we went in to try their veggie burgers, but were told that those were only offered on Tuesdays. We nonetheless enjoyed “Tapas Thursday,” and resolved to return on the next Tuesday for the burger. Last week, we made good on our vow and returned for “Burger Tuesday” (or whatever they’re calling it). 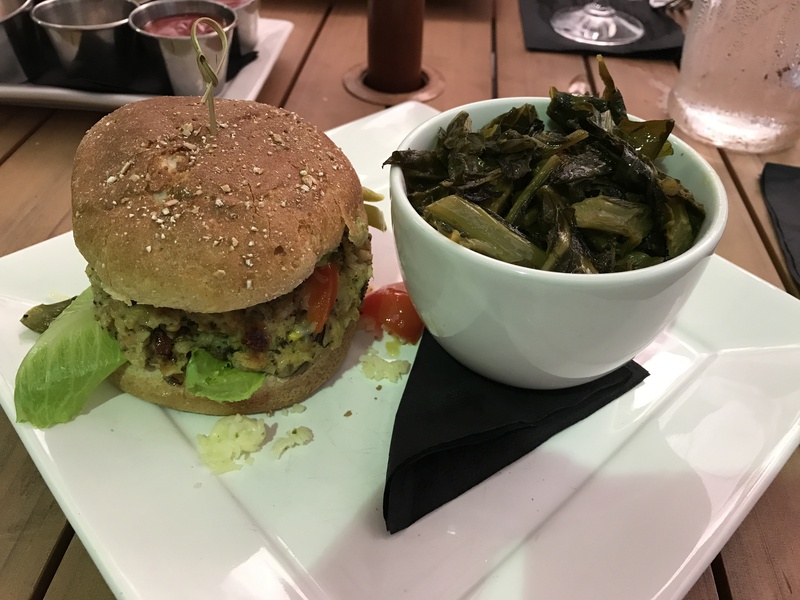 We tried the house-made veggie burger, which is a quinoa-based concoction that you can have served in any of the styles on the menu. One of us had it plain, the other in a spicier version with pepperjack cheese and sauteed peppers and onions. That’s the superior way to go. Though the burger had some issues with falling apart, it was tasty. And the fried oysters we got as an appetizer were on point, perfectly cooked, with light breading so that you could really taste the oyster. We’d absolutely order those again. If you like burgers (veggie or meat), the Tuesday menu at Vintage Year is excellent. The service was attentive, and the price point was right for the high quality. Kate and Stephen are Midtown residents with one cat, a dog, fifteen fish, a garden, an old house and a sense of adventure. They write about life in Midtown here and about life in Montgomery at their blog Lost in Montgomery.